It started snowing last night, by this morning London is virtually closed down. The underground is closed, roads are closed, schools are closed, many shops and offices are closed. Only option left is to play. Same here in Yorkshire. A couple of inches of snow and an entire nation is on its knees. As if there hadn't been enough warning! Good for the children: schools closed and a lot of playtime. Ciao. A. Sounds like a good option to me! 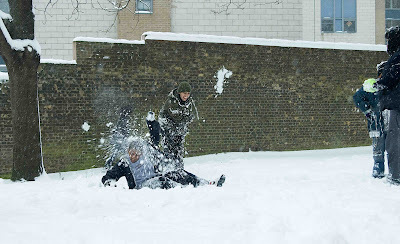 How often does it snow in London? We had some sun a while back - the roads here are clear and traffic seems to be moving - haven't seen the bus go by though (only one an hour) but strangely while it still snowing, some of it on the ground and around roof chimneys is actually melting. I'll have to brave a trip to the shops tomorrow though. Have fun on your snow day! Yes, I've heard it on TV! The biggest snow fall in 18 years! Hope life will get back to normal soon. That much snow in London is kind of unusual, isn't it? It must be pretty quiet in London right now.